The two companies combine the System Integrator platform and home cinema design tool to create a new design process. The combination of TCD and D-Tools will create a complete solution to streamline the process of designing a residential theater. The Cinema Designer (TCD) and D-Tools have announced the official integration between the two platforms. Systems integrators using the platforms will benefit from the ability to seamlessly use TCD’s home cinema design tool with D-Tools’ System Integrator (SI) platform for a timesaving, all-in-one cinema design and documentation solution. Available now, these software tools are optimized to streamline an integration firm’s process from initial cinema concept and design, through to calculating local area pricing for products and labor. "The integration with The Cinema Designer will greatly benefit our customers who are designing dedicated cinemas and media rooms, providing a connected workflow from conception through installation." The combination of D-Tools’ estimation, design and documentation capabilities, along with TCD’s cloud-based home cinema design tool provides systems integrators and installers with a complete solution to streamline the process of designing a technically perfect residential theater, while taking care of all estimation and project management. “The CEDIA Awards has strict judging criteria when it comes to cinema room design,” adds TCD MD, Guy Singleton, who also serves as a judge for the American, Australasian and global CEDIA Awards. “The integration with The Cinema Designer will greatly benefit our customers who are designing dedicated cinemas and media rooms, providing a connected workflow from conception through installation – helping them confidently deliver projects of the highest quality to their customers,” says Tim Bigoness, CMO of D-Tools. D-Tools users designing home cinemas using TCD software will save themselves weeks of work. For instance, once a cinema design is completed in TCD, it can then be quickly exported to D-Tools SI via a .CSV file, with local area pricing, tax, required labor and associated costs fully calculated. 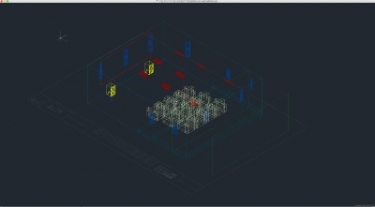 Users will also be able to determine the full complement of I/O connections for all relevant cinema products, as well as importing TCD’s 3D CAD drawings into Visio. Take a look at our sister publication CE Pro Europe for more information. View Jordan O'Brien's complete profile.